Falconry, or ‘Hawking’ as it used to be known, has been a popular pastime in Britain since the Middle Ages. Most of us probably think of it as having been a sport for the wealthy during mediaeval times, but in fact it was also a valuable source of food for the less fortunate. The type of bird of prey you were allowed to keep at this time was very much dependent on your status. Woe betide you if you were found to be in possession of a bird above your station in life; punishment could result in a fine or even imprisonment! So, since many of our resident birds of prey are steeped in history, it seemed quite apposite that we should host a Mediaeval Weekend at the Sanctuary. This was arranged to coincide with Father’s Day, giving all those hard working dads out there a treat to remember. We enlisted the expert services of the ‘Black Knight Historical’ group, who began to arrive on Friday afternoon complete with mediaeval encampment and historical artifacts. The weather wasn’t entirely kind, in fact it rained so heavily on Friday night that I was afraid we would find nothing but a soggy pile of tents on Saturday morning. However the Black Knights are a stalwart bunch and one of them remarked cheerily “Just like mediaeval times!” And it was a fantastic weekend. 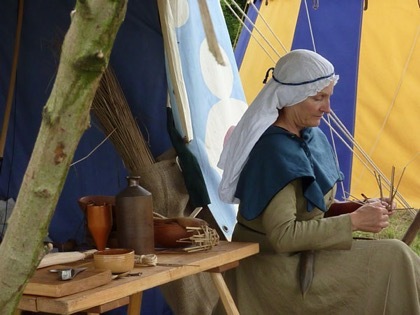 There were knights & soldiers in combat, visitors trying their hand at archery and coin making and all around ‘mediaeval’ people were going about their daily lives cooking, weaving, making armour and giving us a real flavour of life in the middle ages. It was a great success and we’ve since had many comments about how much visitors to the Sanctuary enjoyed the whole experience. Small snippet of interest: The proverb ‘A bird in the hand is worth two in the bush’ originates from mediaeval falconry. The bird in the hand relates to the falcon on the glove, which was obviously very valuable and worth considerably more than two of its potential prey in the bush! It's better to have a small, definite advantage or asset than just the hope of a greater one.